Up until the moment Libya descended into catastrophic violence last February, Saif al-Islam Gaddafi was under strong pressure by close associates to break ranks with his father's regime. They believed that he, more than anyone else, might have been able to save his country from a disastrous eight-month war, one of the younger Gaddafi's former top aides has told TIME in an interview. Now, his final role will instead be as a reviled defendant on trial, rather than a political hero, and he could face life imprisonment or execution. Libyan forces finally cornered the fugitive Saif on Saturday near the Libyan Sahara town of Sabha, about 400 miles (645 km) south of Tripoli. Muammar Gaddafi's 39-year-old son  his father's closest adviser and likely successor  had been on the run for more than four weeks, after apparently fleeing on Oct. 20 as rebels closed in on the Libyan leader in his hometown of Sirt. As rebels set upon his father and killed him that day, Saif is believed to have slipped past rebel checkpoints and escaped into Libya's vast desert. Tripoli erupted in wild rejoicing on Saturday afternoon as news broke of Saif's capture. As people fired guns in the air, it was unclear who  Libya's armed militias or the country's nascent government  would decide whether Saif would be handed over for trial by the International Criminal Court in the Hague, or jailed and tried in Libya. Saif's capture was announced by Bashir Thaelba, a leader of Libya's Zintan brigade, who said he was being held in that town, west of Tripoli. "We are going to treat him well as a war prisoner," he was quoted as saying on Saturday. But Youssef Sawani believes that Saif might have avoided that fate altogether  and in the process changed the course of Libyan history  if only the dictator's heir had listened to him and others who begged him back in February to join the rebels before it was too late. "My recommendation to him before the revolt was to dissociate himself completely from the regime," says Sawani, the former executive director of the Gaddafi Foundation, Saif's hugely powerful political organization. "He could have broken away." Sawani says that on Feb. 6, days before Libya's revolt erupted in eastern Libya, he went to Saif's home and pleaded with him to switch sides. "I suggested to Saif that if he was completely frustrated he should quit, become a dissident and leave the country, and lay the responsibility on the shoulders of the regime." At the time, Sawani argues, many Libyans would still have accepted Saif as the person best able to stop Libya's descent into all-out violence and the single best hope to persuade his father to retire in exile. "Libyans were banking on Saif," he says. "He was widely accepted by intellectuals, activists, and the liberal opposition in the diaspora." Sawani's view is disputed in other interviews, including the former rebel Prime Minister Mahmoud Jibril, who had previously worked for Saif's National Economic Development Board, and who told TIME last month, "Saif deceived us all. The real Saif was much uglier than his father." Sawani, who has a political-science doctorate from the University of Canterbury, had been hired by Saif in 2007 to oversee sweeping political reforms in Libya  changes that Saif has long claimed were blocked by his father's hard-liners. In interviews in February 2010 and in March this year, Saif told me that his strong efforts to bring democracy to Libya had been stymied by the Gaddafi regime. If it was true that the son's reform efforts had been stonewalled by Gaddafi's hard-liners, there was a moment in which Saif could well have abandoned his father and carved a new political future, according to Sawani. By early February, Saif was frantic about the Arab Spring spreading to Libya  Egypt's revolution next door had forced President Hosni Mubarak from power on Feb. 11. While demonstrations erupted in Benghazi and surrounding towns, Saif vacillated for days about what to do. Ultimately, says Sawani, Saif could not grasp that the protests would crush his father's 42-year rule. Indeed, in March  days before NATO's bombing campaign began  Saif told me he believed his father would quickly end the revolt and re-establish control, even if NATO intervened. Saif's problem, says Sawani, is that he felt unable to betray his family. Sawani visited Saif at home on Feb. 16, one day before Libya's revolution began, and told him he was resigning as his director. Saif was upset, he says. "It was a time he needed more help and assistance." Without his reformist aides, Saif's options quickly diminished. On Feb. 20 he sealed his fate, appearing on television vowing to crush the rebellion with extreme violence. Sawani says a close friend of Saif met him shortly before his speech, and agreed with Saif that the younger Gaddafi would appear on TV to reassure Libyans that the regime would "advance their demands." Sawani says he was in touch that night with rebels in Benghazi who had sat glued to the television, hoping that Saif might break away. Instead, Sawani says, "he came out and said the opposite. Everyone was shocked." What happens next to Saif could be subject to a contentious international battle. Saif is under indictment by the International Criminal Court for crimes against humanity, for allegedly ordering the killing of unarmed protesters in eastern Libya in February, before the rebels took up weapons. 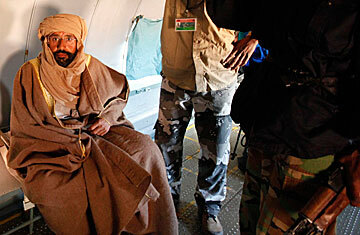 Also indicted is Muammar Gaddafi's former intelligence chief, Abdallah Senoussi, who remains at large. As a U.N. member state, Libya's new leaders are legally expected to transfer Saif to the Dutch city for trial, but many Libyans are now saying they want to see Saif  by far the most powerful figure from Gaddafi's era left alive  tried at home. That would allow millions of Libyans to feel they are receiving redress for their suffering under Gaddafi's ruthless dictatorship. See pictures of Gaddafi's four decades in power.